The conversion of fresh and dried Nigerian tomatoes into paste by Erisco Foods Limited could save the country over $1 billion being spent annually on importation of tomato paste. Eric Odinakachukwu Umeofia, chief executive officer of Erisco Foods, said this at a tour of the company’s Ikeja plant in Lagos at the weekend. 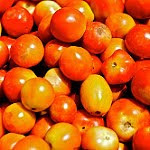 Umeofia, who superintends the largest indigenous tomato paste factory in Africa’s biggest economy, said the company would also export and earn millions of dollars in 2017 after meeting the tomato needs of the domestic market by December 2016. “By God’s grace, we can achieve this, provided that government stops the dumping of fake/ substandard tomato paste on us. We are set to employ over 50,000 youths in two to three years, with over five million jobs for farmers indirectly in our Katsina, Jigawa and Sokoto State backward integration projects that are going on there now,” he said. “We target to start production from our Katsina project in the first quarter of 2017, provided that we get support from Nigerians. We should be careful of supporting people that will go back to their countries when the chips are down as their only interest or love is Nigerian money and nothing more,” he succinctly stated. He said Erisco was on the forefront of the Federal Government diversification policy, stressing that there was so much sabotage going on in the economy that must be stopped. “It may interest you to know that Nigeria is the biggest importer of tomato paste in the world, while over 75 percent of our fresh tomato harvested get wasted in the hands of farmers yearly due to the fact that there is no means of making use of them industrially,” he said, adding that Nigeria was blessed with two favourable planting and harvesting seasons whereas China that would export tomato products to Nigeria had only one favourable planting and harvesting season due to their climate condition. “The Indians that form the majority of the people importing fake/ substandard tomato paste into Nigeria, and China that produces the fake/ substandard products do not consume in their own countries the same quality of tomato paste they produce and dump on Nigeria. Yet they pay little or nothing as import duty. Can you see that the mafias are determined to kill our people and economy with impunity in connivance with few civil servants?” he asked. He said Erisco had been campaigning for the ban of tomato paste importation into Nigeria for about two years now, yet nothing had been done, despite a February 10, 2015 report by NAFDAC stating that 91.1 of imported pastes into Nigeria were sub-standard. “It may interest you to know that it took European Union barely a month to take decision and place ban on the importation of some Nigerian food products till 2019. This is food for thought for our government,” he further said. He urged the Federal Government to provide foreign exchange and credit to genuine manufacturers to enable them grow, stressing that it would be anti-progress to support traders, importers, political manufacturers and foreigners with scarce FX. Olufunke Aleshinloye, general manager, Nigeria Social Insurance Trust Fund, who represented Chris Ngige, minister of labour and employment, urged Erisco management not to relent in carrying out business activities responsibly, bearing in mind that laws must be complied with in labour-related matters, occupational, health and safety standards. “The Nigerian economy needs this kind of innovation and diversification, which has led to job creation in the agricultural sector with regard to the feeder farms that provide the raw materials, the engineers that set up production plant and maintain its constant functioning, as well as the factory workers that turn raw materials into finished products, which are then marketed by entrepreneurswholesalers and retailers alike,” Aleshinloye said.